"There is no change in our position on the Armenian-Azerbaijani Nagorno-Karabakh conflict. This conflict must be solved only within the territorial integrity of our country. Nagorno-Karabakh is our ancient, historical land. 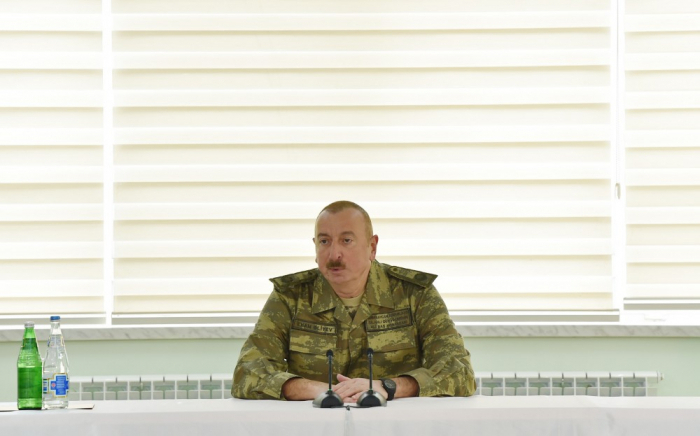 Azerbaijani people have lived, built and created in these territories for centuries", President of the Republic of Azerbaijan, Commander-in-Chief Ilham Aliyev said during his visit to a military unit of the Special Forces of the Defense Ministry, on April 2., AzVision.az reports. Today the whole world recognizes Nagorno-Karabakh as an integral part of Azerbaijan. All respected international organizations have adopted relevant decisions and resolutions on the issue. These are the historical and legal basis. No country has recognized the so-called" Nagorno-Karabakh Republic and will not recognize. The aim of the negotiations is to liberate the occupied territories. The new leadership of Armenia tried to change the format of the negotiations. However, the unambiguous position of Azerbaijan did not allow it. This conflict is between Armenia and Azerbaijan. Our lands were occupied by Armenia. 80 per cent of the military personnel in the occupied lands are Armenian citizens. Therefore, the negotiation process should be carried out between these two countries. The latest Vienna meeting once again confirmed the existing format of negotiations. The negotiations conducted between the foreign ministers and the leader of these countries show that this conflict is between Armenia and Azerbaijan. Therefore, when we talk about this conflict, we call it "the Armenian-Azerbaijani Nagorno-Karabakh conflict". The President noted that justice and historical truth, as well as the economic and military power, is on the Azerbaijani side. Reforms in the military field and the increasing power of our military inspire us in both the political arena and battlefields.